The Michell Gyro SE is a classic British turntable that consistently scores well in our reviews, so it didn't take much for the company to tempt us with this limited edition version in a 'blue steel' and black finish. The SEduction version of the Gyro SE is being sold as a complete package with Michell's TecnoArm, HR power supply and matching record clamp. What's more, there's only 99 serial-numbered examples being made. The Gyro SE has always been a good-looking turntable and this new finish brings a degree of sophistication that you don't often encounter at the price, but do the extras warrant the price premium over a standard machine? The Gyro SEduction is a suspended turntable with a spring under each 'tower' on the ring-shaped black subchassis that surrounds the platter. The ring is an aluminium casting with weights on the underside to balance the tonearm at back right. Each suspension post sits on an aluminium leg with an adjustable spiked foot at its base; the set up instructions suggest using these feet to level the turntable prior to putting the subchassis and platter on, but it pays to get your support as level as possible first. Set up is a little more protracted than with most modern turntables and the box contains a fair number of bagged components that need to be assembled, but the process is pretty straightforward and the instructions reasonably clear. A photographic run-through might help the uninitiated, but this is where the skills of a competent dealer will be invaluable. We were impressed that the bubble in the spirit level, which sits on the centre pin, remains central when the platter is turning; not many turntables are that well engineered. The platter itself is made of an acrylic/vinyl mix with weights fixed to the underside to give it inertia. These are usually polished brass, but for the SEduction the brass has been sleeved in blue-steel aluminium. The platter is driven via a round section belt and a DC motor in a superbly finished cylindrical case that sits directly on the supporting surface. The elements that you don't get with a standard Gyro SE are the TecnoArm and the HR power supply. The latter uses the Never-Connected system to reduce the effects of mains-borne noise and has an on/off switch up front, but, as there's a very convenient switch atop the motor housing. One feature that's worth investigating is the speed adjuster. You can use this to precisely set the platter speed if you have a suitable strobe disc. 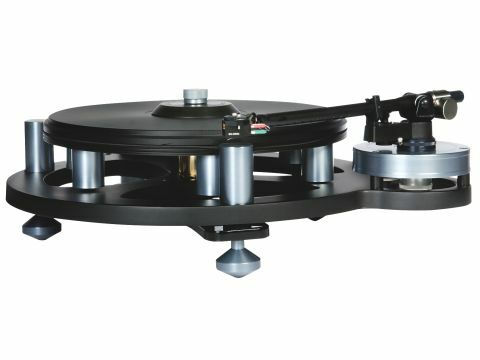 The TecnoArm is Michell's variation on Rega's classic RB300 and quite a heavily worked one at that. It has a different counterweight stub to take an underslung weight (two are provided to suit different cartridges), provides full VTA adjustment with a pair of threaded collars and has the headshell machined to be in line with the bearings. What you can also see is that there are holes in the underside of the armtube which reveal foam inside, the holes are said to increase rigidity and the foam provides damping. The high finish quality is achieved with bead blasting. The Gyro SE has always managed to combine solid engineering and good looks and the SEduction finish does it no harm in either respect. Build quality is extremely high throughout, the inverted oil-pumping bearing is both very attractive – thanks to its polished brass finish – and rather clever in that it maintains lubrication at the thrust point where any amount of friction is detrimental to sound quality. The trick is to set the suspension up so that the subchassis is very close to the felt washers on the spider and to centre the springs within their cut-outs. There aren't many suspended turntables around anymore, the Linn LP12 is the most obvious competitor and in its Majik guise hits a similar price point. Avid is another player in this sector, its Diva II model has elastomer rather than coil spring suspension, an MDF platter and a cast rather than machined finish. If you can provide a well-isolated support for a turntable, then there are a number of very fine solid plinth options around including the Townshend Rock 7. It doesn't look quite as good as the Michell, but its damping trough gives it a mechanical advantage. Finally there's the standard Gyro SE, which can be had with a Rega RB301 for £1,340. In many respects the sound of this turntable and arm reflects its build quality and even its overall appearance – it's open by design and open in sonic character. It's also polished and sophisticated, presenting a coherent and extremely stable soundstage that delivers genuine sonic holography when the right slab of vinyl is on the platter. We started out using a van den Hul DDT II cartridge, a brand that Michell MD Steve Rowland is not keen on, but one that lets the turntable produce a good solid groove thanks to excellent bass definition. We really like the way you can hear what's going on with each instrument in an ensemble – double basses in particular seem more nimble and dynamic than usual. The Keith Jarrett Trio demonstrated this to boogie-inducing effect on the Changes album, and the way those musicians manage to improvise such a co-ordinated result really transports you when it's reproduced with this degree of clarity. The quality of temporal and three-dimensional stability is what separates this package from the regular Gyro SE and we suspect that the degree of calm with which the system deals with dense material is also down to the TecnoArm, which helps to deliver impressive depth of detail and the stunning imaging that comes with it. One older LP of Alfred Brendel playing Beethoven was particularly startling to the extent to which you could hear both the auditorium and the nature of the recording itself. It wasn't until we got the setup sorted that such entertaining and impressive results were achieved. Iif you audition a Gyro SE and it isn't timing well it's probably a fettling issue. In SEduction guise this is a polished and revealing turntable that is very low on colouration and high on detail, the sort of detail that makes you realise just how good vinyl can be and why it is making such a big comeback. With a great slab of the stuff it can place the music in the room in totally unfettered fashion, with instruments and voices placed precisely in the soundstage. Gripping stuff indeed.